This was the third time that we stayed at Pondok Bambu and there is something nice about revisiting somewhere you have stayed previously especially as the staff welcome you like family (although like friends is proably more appropriate, depending on your family). They even gave us the same room so was a bit like going home. After driving the van around for nearly 7months exploring Europe it was nice to relax in familiar surroundings at the hotel especially one right on the ocean at Candi Dasa. There are only 12 rooms at Pondok Bambu and there were only between 4 and 7 rooms occupied while we were there and two of those were for our friends Robert and Gay and Robert and Renate from Sydney who joined us there. We had a nice relaxing time sitting and chatting and eating and drinking for a lot of our time there but we also hired a local boat for about $10 each to take us down the coast to the “Pasir Putih” or white sand beach where we spend a few hours lazing and taking dips in the beautiful clear water of the bay. Lots of little fish were interested in us and followed us around. We literally had to shoo them away. Just behind the sun lounges and umbrellas were small open air restaurants serving fresh fish for lunch. One of the Roberts wanted to go fishing so I joined him and we left at 6am in the local boat which rests on the sand down the steps from the hotel. It was lovely being on the ocean early in the morning to see the sunrise and although we only caught a few small fish – the smaller ones we threw back – we enjoyed our few hours on the calm sea. Another day most of us struggled up “Gumang Hill” with a guide to get the most beautiful panoramic views of the coast and of “Mt Agung”. The hill had been terraced years before for peanut cultivation but was now disused and only a few cows grazed the area. It was a lovely clear day and we had to leave at 6.30am so as to be at the top to see the sunrise and also as Mt Agung is often shrouded in cloud later in the morning. Most of us looked as though we had had a shower in our clothes as we were wet through with perspiration (sweat really). There were a lot of curious monkeys on the way up the hill and at the temple which is situated opposite Mt Agung. There are some beautiful large trees and enormous old frangipani trees in the temple area. Our guide blessed us before we proceeded to the temple and he laid offerings at several of the altars and prayed while we took in the scenery. By the time we had walked down the hill – many steps and slopes – and three hours of hiking we didn’t feel like the 1/2 hour walk back to our hotel so the guide hailed us a local bus which stopped in front of our hotel to let us off. The Ghandi Ashram is located next to the large lotus pond and we went to yoga there on a few occassions. The yoga platform was located overlooking the ocean and “Kawi” the balinese yoga master was a good instructor. One night we went to a local “warung”-restaurant, where there were only two tables so the owner said “no problem” and seated us under an umbrella in his front garden next door where we ate a nice home cooked meal of fresh fish, balinese fish curry, chicken curry and vegetables. We finished with fried bananas which are a very common dessert in Bali. Another one is “Dadar Gulung” which are bright green pancakes filled with grated coconut and palm sugar. The colour comes from the pandan leaves although it looks anything but a natural colour. Indonesia is holding general elections on the 7th of April and as a result of this we saw many black cars and trucks full of people with colourful flags and many young men on motorbikes holding flags as they raced along to their political rallys. Our friends left us for a few days in Ubud in the hills and we joined them the next day after Maurice and I had been to our little hairdresser there where I had a cut, colour and blow dry and Maurice had a haircut – all for $20. We all went to Cafe Wayan (a very typical Balinese restaurant) which has been there since 1986. Their gardens are beautiful and the staff are dressed in traditional clothes and are very efficient and friendly. Maurice and I continued (after farewelling our friends and our other local friends in Ubud) on to Seminyak (about 1 1/2 hours away) to stay for our last few days to do our last bits of shopping and have our last wonderful inexpensive massages and treatments and to catch up with a couple of friends from Perth who had just arrived in Bali. Seminyak is a lot more commercialised than Candi Dasa with lots of boutiques, cafes and a myriad of upmarket hotels, resorts, shopping centres and restaurants. As you move further south towards Legian and Kuta beach areas the upmarket shops give way to open shop fronts with more or less the same rayon clothes, cheap sunglasses, hats, watches etc,etc,etc. We went for a 2hour walk along the Seminyak, Legian, Kuta beachfront where the hawkers are still to be found and the little ladies give massages on the beach for $5. We saw a truck with a load of styrofoam boxes which were full of live prawns and shellfish. An airpump aerated the water. As the driver stopped next to a restaurant we saw him scoop up the live prawns into a bucket which were then delivered inside. We had booked a few weeks before into Mamasan’s restaurant which had been recommended to us. We had a wonderful meal and the entree portions of finger food were so large that we had enough for lunch the next day. The place was buzzing and packed and the food was very innovative and delicious. We were not happy to be back in the chaos of traffic and loud motorbikes again and were glad it was only for a couple of days. Maurice had a chat to an older taxi driver who told him that he was glad that he was near the end of his working life as everyone today was in a hurry and didn’t have time to chat or ( like in the old days) invite him to have a cup of coffee. We left Bali on the 30th March to avoid Nyepi Day of Silence which this year fell on 31st March. The Balinese New Year is 78years behind our calendar so it was going to be 1936. We saw hundreds of people who had brought their offerings to the beach and were then transferred by trucks to the temple for their “Melasti” ceremony. There was another large gathering around the corner from our hotel where they cordoned off the road and the people in their traditional ceremony white clothes sat on the road in front of the temple and listened to the priest drone on for hours. It is not a very uplifting sound by the priest but a very long wailing type of praying. Bye Bye Bali for another year. 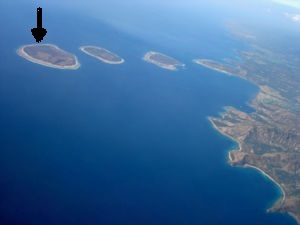 Gili Air is the island closest to the mainland of Lombok and the only island with some fresh water. This is running low so they also cart water over from the mainlan. There are as on Gili Trawangan no cars or loud motorbikes on the island and it is a much quieter island so very tranquil especially in low season with fewer tourists. Luckily (or rather on a recommendation) we chose a place to stay (the Chill Out bungalows) which had fresh and hot water showers although here you need very little or no hot water as it is much hotter and more humid than in Ubud. There was also a lovely yoga centre on the island 15minutes walk or a 5minute horse and cart ride inland from where we stayed so we went either at 10am or 5.30pm in the evening which was more comfortable as it was not so hot then. We had 5 sessions of yoga and the yoga masters were excellent. There is an abundance of fish and shellfish on offer and the prices are very reasonable. A very large tuna and vegetable kebab including baked potato and two salads was only 45,000 rupiah or $4.30. Breakfast which was included is very generous and consists of 3courses (if you want it all) with any combination of muesli, fruit, honey and yoghurt followed by two eggs any style and then a banana or pineapple pancake. We made do with two options. The coffee is not espresso so we opted for ginger tea which was delicious. Gili Air has a much more back to nature feel about it and most of the path around the island is sand. There are not so many “cidomos” horse drawn carts so it tends to be very much quieter around the island. The first bungalow had a very musty odour about it and after telling the friendly staff they obliged the next morning and we were given a much larger bungalow. There are few tourists on Gili Air and most that visit the island are either diving or snorkelling during the day so the island feels almost deserted. The nice thing also about the island is that you are not constantly being asked if you want this that or the other all the time and even the few hawkers on the beach selling sarongs and jewellery were very polite and not insistent. The water was crystal clear and a lovely refreshing temperature and even without a mask and snorkel you could see the fish and the ocassional turtle in the water. I spent a lot of time in the water while Maurice had a quick dip then stayed out of the sun so as not to get burnt. We decided to try out the “Vista Mare” Italian restaurant which had been very well written up on trip advisor with glowing reports about the Italians running the place. After missing the place after walking for an hour we had to retrace our steps and finally found it to be told that they had left four months previously and the new owner/chef was Balinese. Just our luck! Again we assured that the chef knew how to cook Italian food so we stayed, mainly because of the sunset which was beautiful but we were disappointed with the food. After three efforts to eat other than Indonesian fare just for a change we decided to stick to the BBQ’D fish and local fare which was delicious. We had a great meal at a new restaurant on Gili Air called “Caballito de Mar” which was excellent and another good meal at the “Waterfront” restaurant. All other meals we ate at our “Chill Out” restaurant which was so reasonably priced and excellent food and value. For 7main meals, 12 fresh juices,4 soda waters, 3 icecreams, 3lots of prawn crackers and a coffee the bill came to $74 for the week. having swims in the beautiful aqua water and seeing all sorts of tropical fish without even a snorkel was wonderful. 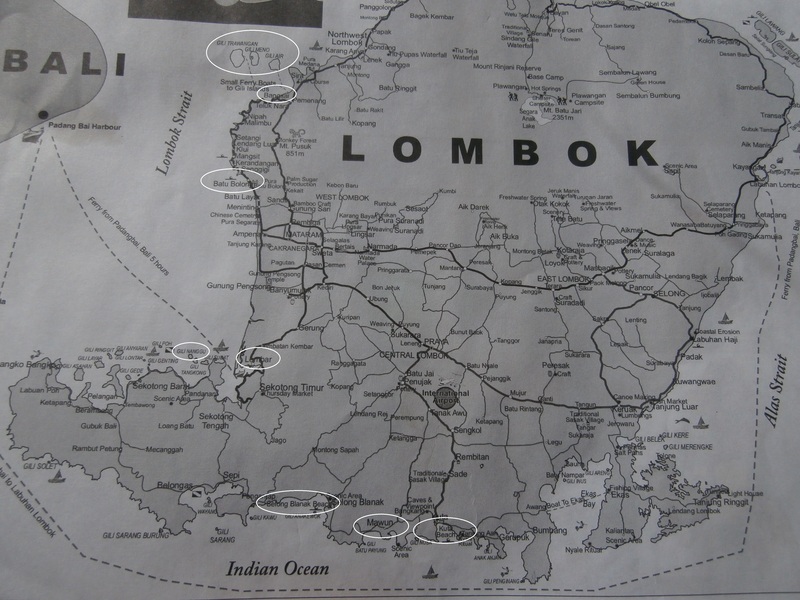 We just hope that this island does not get overdeveloped like Bali did and although only three small islands it could easily be ruined in time especially with the new airport on Lombok and direct flights from Perth to Lombok which are very reasonably priced. There was plenty of accommodation and many cafe/restaurants but very little else apart from a few small shops selling water and biscuits and a few clothes or otherwise dive shops with snorkels and masks and bicycles to rent. Most people seemed happy to walk around the island as we did. We found one of the many tours and travel booths selling tickets for transfers to and from the island. We didn’t want to leave on the public boat at 8.30am so we arranged to go by boat at 10am to Bangsal harbour and then by car to our hotel “Sunset House” in Senggigi on Lombok. We arrived at the small harbour as arranged at 9.45am and by 10.30am there was no sign of a boat for us and after several phone calls, the chap we booked with turned up and said that we would have to get the public boat which leaves when it is full. I gave him a mouthful about not telling us the truth but it all turned out alright in the end with us going on the public boat about 15minutes later and a very nice trekking organiser from Lombok helped us to find our car when we stepped ashore. We were prepared and I wore my crocs as you get onto and off the boat and into the water. Our faith in human nature was restored! We secured our second visa extension and set off for Gili Trawangan on the 1st March on the fast boat “the Gili Cat” for the 1 1/2 hour trip to the island via Lombok. It was a beautiful clear day with a very calm ocean which made for a very pleasant trip for the ten of us on board. Gili T is the largest of the islands and known as the party island – no not why Maurice and I are there. The east coast where most of the accommodation and restaurants are found has almost clearly defined areas. The bulk of the cheaper bars/restaurants and bungalows are near the night market and go to the left and right of the main jetty. The further you walk to the south west of the island is where you find more paved areas and swanker restaurants, bars and accommodation. It is still low season and therefore there are not many tourists on the island which makes it very pleasant. The “Beach House” bungalows where we stayed was nice and quiet as the rooms/bungalows are at the back of the property away from the main drag where you nearly get high with the smell of “pot” as you walk along in the evening. There is an abundance of fresh fish and many restaurants have BBQ’s fired up to entice the tourists. We found a yoga class and attended one evening and one morning session while we were on the island. There were 20 odd younger people in the evening class but only Maurice and I made it to the 7am class in the morning and so had a personalised session. We also found a lovely beach area offering very comfortable sun lounges with attractive bamboo constructions to offer maximun shade overlooking the the water with Lombok in the background. These cost us nothing as long as we spent 100,000 Rupiah each($9.50) for the day and surprisingly the drinks and food were very tasty and reasonably priced. We walked half way around the island taking the inland path out to the beach on the west coast of the island to see the sunset which was worth doing. There are many cats on the island (haven’t seen a dog) and a few volunteers offered their services as part of the “Gili eco trust” in December to spay and sterilise over two hundred cats and return them to where they found them. All the cats we have seen have looked in reasonable shape unlike many of the poor dogs in Bali. We hired bikes on our second day ($7.50 for 2bikes for the day) and road around the island. You have to watch where you are cycling as the paved paths are rather uneven with bits missing. There are also some areas with a lot of sand and we had to walk the bikes to the next lot of paving. It was a very humid and hot day so we were glad to find a nice beach with not so much broken coral near the shore. The water was crystal clear and even without a mask I could see the fish and a turtle swam right in front of me. On the 4th March we had leisurely breakfast, checked out and left our luggage at reception to wander down and have a swim before heading on to Gili Air for a week (the island closest to Lombok) on the public ferry at 4pm which cost all of 30,000 rupiah. The trip took about 20 minutes after stopping to let some passengers off at Gili Meno.